Sukkot is here and my guests are on the way. 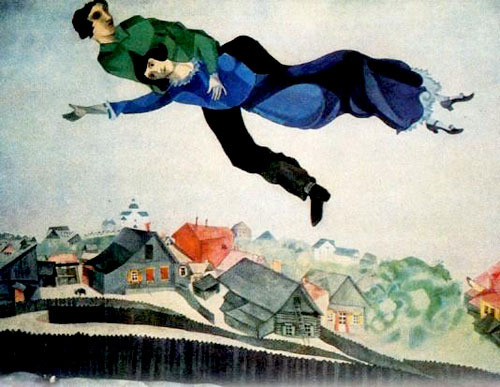 Like Chagall’s lovers they fly over the silver moon; their white gauzy clothing double as wings. I greet them in the sukkah—a makeshift structure akin to a hut that we build from a kit. The sukkah also has a roof with slats generously spaced to see the sun and the moon and the stars. The company I’m talking about stargazing with is called ushpizin—the Hebrew term for mystical guests who will grace sukkot (plural of sukkah) all over the world on each of the seven nights of the holiday. This is my kind of celebration. When I was a kid I loved reenactments of historical events. The old sitcom Bewitched tickled me because someone like Columbus or Shakespeare came alive for me. To that end, I have a wish list of historical figures I’ve always wanted to meet. Moses and Leah top my list. No one is more associated with the Torah than Moses. In my mind, he’s an inspiration because so much of his leadership was marked by doubt. As a parent in the 21st century, I take solace in the fact that even with God’s direct intervention, Moses still had a difficult time leading the Israelites out of the wilderness and into the Promised Land. Leah is my role model as a mother. Every parent has been a Leah at some point—taken for granted, ignored, but still triumphant in ordinary yet miraculous ways. The Rachel that I want to meet was Rabbi Akiva’s wife. I like her rebelliousness. She was from a prosperous family who followed her heart and married the illiterate Akiva against her family’s wishes. To complete the fairytale, she recognized Akiva’s natural genius and encouraged him to learn to read when he was 40. Forty! Akiva excelled in his studies beyond their wildest dreams. Rachel was alone for years as he studied and taught in the greatest Jewish academies. In his absence, Rachel coped with grace and fortitude. I want to ask her how she did it. I want to know if she was as disoriented as I am when my husband is only away for a week on a business trip. I want to know how she controlled herself when her husband finally came home and his students, protective of their beloved teacher, did not let her through the throng to greet him. 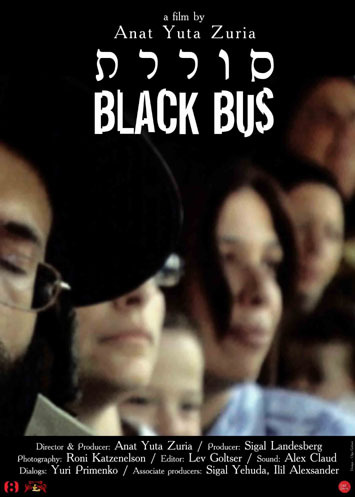 When Akiva realized what was happening, he ordered his students to let Rachel pass immediately. He told them that she single-handedly was responsible for everything that he and his students had attained. I want to know if witnessing her husband’s success was worth sacrificing his company all those years. I want to introduce my daughter Anna to Sara Schenirer. Hunched over her sewing machine, she had a revelation. Or was it a moment of despair that gave way to lucidity? She dared to imagine girls in their own schools studying Torah. It was a radical idea in the late 19th century. Although nowhere near egalitarian, the fact that girls had a classroom of their own to be formally educated was inspiring and enduring and just. I want Anna to know that she is the direct beneficiary of Sara Schenirer’s prescience. I love spirits. I buy into the notion that there are other times during the year for formal visitation from phantasmagoric souls. There are the seven days of shiva or mourning. The week during which the sheva b’rachot—the seven blessings following a marriage—are celebrated. We boldly mingle with our ancestors on Passover when Elijah joins us and Miriam remembers us with a shake of her timbrel. But it’s on Sukkot that I reflect on people I would give almost anything to see again. I close my eyes and see my father healthy and strong. I remember my father-in-law’s mega-watt smile and can-do optimism. I feel the presence of Anna’s namesake—a grandmother whom I adored. I miss my friend Miriam so much that I ache. 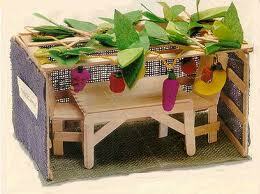 My sukkah is a space painted in a full spectrum of memories and emotional colors. It makes sense that a holiday that welcomes ghosts to the dinner table would end with Yizkor—the service to memorialize the dead. Yom Kippur and the three harvest festivals—Sukkot, Passover and Shavuot—are the four times a year there is time and space to mingle with loved ones who have died. What comforts me most about remembering my dead on Sukkot is that I can walk out of my fragile sukkah into the sturdy structure of community where, I believe, a lot of people understand that otherworldly visitors frequently stop by throughout the year.